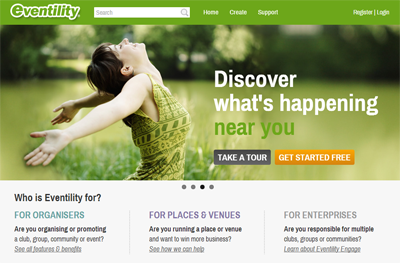 If you are organising an event this summer look no further than Eventility as the best tool to help you promote it. The google analytics graph below shows how much web traffic was generated for a recent, local, Jubilee event posted to the site. We have optimised Eventility for search engines, making it really simple for you to get your events found. There are just a few things to remember. 1. Include the type of event in your title. For example, if you are running a music festival called Rockabilly, using the title “Rockabilly music festival” will help you get found when people search for music festivals. 2. Don’t forget to set your event location. People are usually looking for things to do near them, and search accordingly, so when they type in “Music Festivals Cambridge” your result will be more relevant. 3. Make good use of your event tags. These keywords form another layer of information indexed by search engines. For example, the music festival organiser could use performers names as the keywords, helping to attract people searching for those acts. Of course these rules equally apply if you are setting up a club, group, community or venue and you want to get the maximum eyeballs. While we can’t control the weather, we can give you even more help with organising and promoting your event, including selling your event tickets online. Just head over to the Eventility support forums or take a quick tour of the site.